Spanish food and wine fairs, wine trade fairs, , promotional events and gastronomic conferences can keep dedicated Spanish wine professionals, foodies and aficionados alike busy all year round, as I found out over the course of 2007, when I made a half dozen ten trips to Spain, many of them connected two and three deep to Spanish wine events. 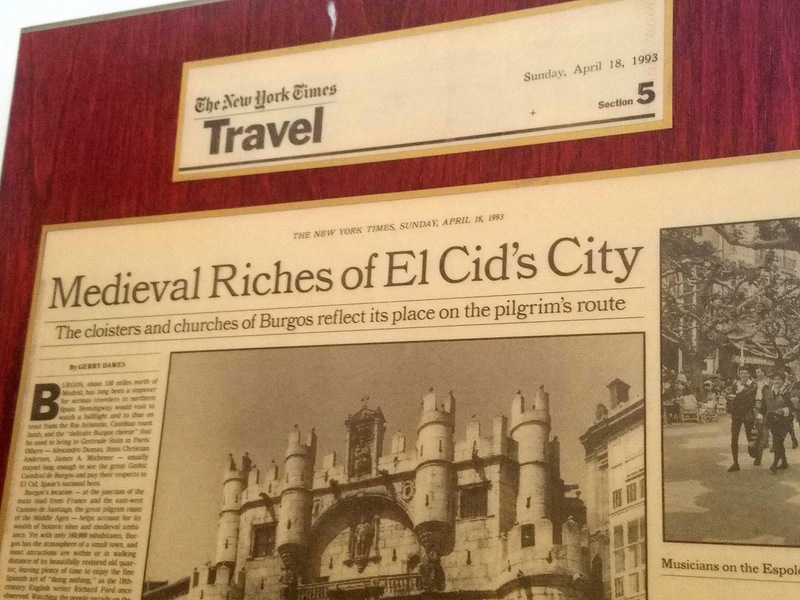 Spain now has thousands of wineries and it takes a lot of tastings to bring all that wine to the attention of the press, importers and consumers. 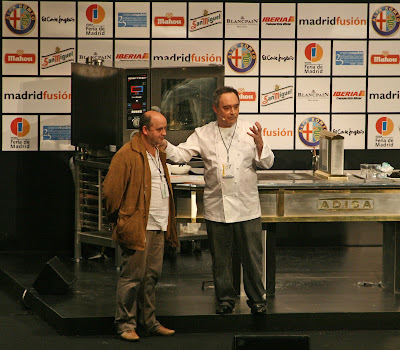 In January, it all begins at Madrid Fusión, an annual event, where a roster of the top chefs in Spain—augmented by other star chefs from around the world—come to show the latest superstar cooking techniques. Taking best advantage of the drawing power of the superchefs, ICEX Vinos de España / Wines From Spain puts on a star-studded show of their own at the event. 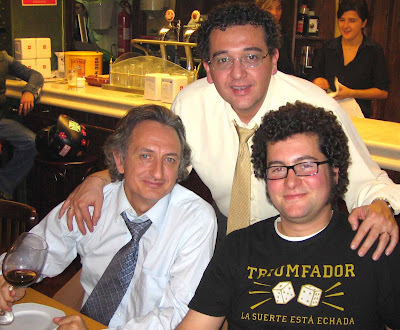 In 2007, celebrating its 25th Anniversary, Wines From Spain presented more than 130 top-rated Spanish wines in several España: Vientos de Terruño / Spain: Winds of Terroir tastings at Madrid Fusión. La Rioja also presented two big panel tastings—one contrasting classic and modern style Rioja reds, the other focusing on versatility of the tempranillo grape. That was just the beginning. Later that month in Valencia, the sixth edition of Encuentro Verema, one of Spain's most prestigious wine conferences, took place in Valencia on January 26 and 27 at the five-star Meliá Valencia Palace Hotel. 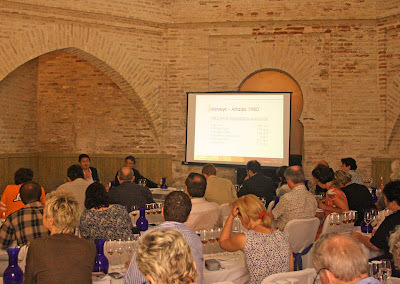 The conference, organized by Valencia-based verema.com, one of the world's most visited wine websites, featured two days of high level seminars and tastings. Bodegas Herederos de Marqués de Riscal, presented "The Evolution of Rioja Wines in the Past Century," following by a tasting of historic vintages of Marqués de Riscal Reserva wines back to the stellar, legendary 1945, as well as their 2001 Barón de Chirel, perhaps the greatest in that wine’s history. The next day, Managing Director-Winemaking Team Leader Agustín Santolaya of Bodegas Roda presented a tasting of representative vintages from the winery since its creation. 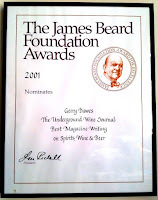 One of the event’s highlights was the presentation of the Verema Awards for 2006 to: Best Bodega 2006: Bodegas Roda; Rising Star Bodega: Viñas del Vero; Best Wine Award 2006: Vega Sicilia Único 1994; Wine Personality of the Year 2006 Award: Mariano García of Bodegas Mauro, Maurodos and other wineries; and Award for Best Restaurant Wine Service: Restaurante Atrio (Cáceres). 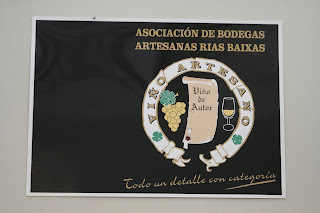 In early March in Ferrol (A Coruña, Galicia) the Chamber of Commerce of Vilagarcia de Arousa staged the bi-annual (2009 is next) Fevino—Fería de Vino de Noroeste—a show based primarily on the white wines of Galicia, but with exhibitors from around Spain. Here, in a less crowded environment, some 300 bodegas brought more than 1,000 wines to taste. This one is particularly good for importers and the press interested in the wines of northwestern Spain, because sit-down sessions with bodega principals and representatives are available on a one-on-one basis. Also a bi-annual fair—and the biggest of them all—is the huge Alimentaria fair, a huge event with thousands of exhibitors (which next will take place in Barcelona from March 10-14, 2008). Hundreds of bodegas bring thousands of wines to show and along with a mind-boggling variety of foodstuffs, there is Barcelona’s equivalent of Madrid Fusión, the less well-known, but superb BCNVanguardia Congreso Internacional de Gastronomía de Alimentaria, all of which combine to make Alimentaria a not-to-be-missed event for wine lovers and foodies alike. In April, back in Madrid at the Casa del Campo, the Grupo Gourmets, for the past 21 years, has staged the Salón Internacional de Gourmets in three different exhibition halls, where some 1,000 exhibitors show an estimated 35,000 products, among them thousands more wines from all around Spain. 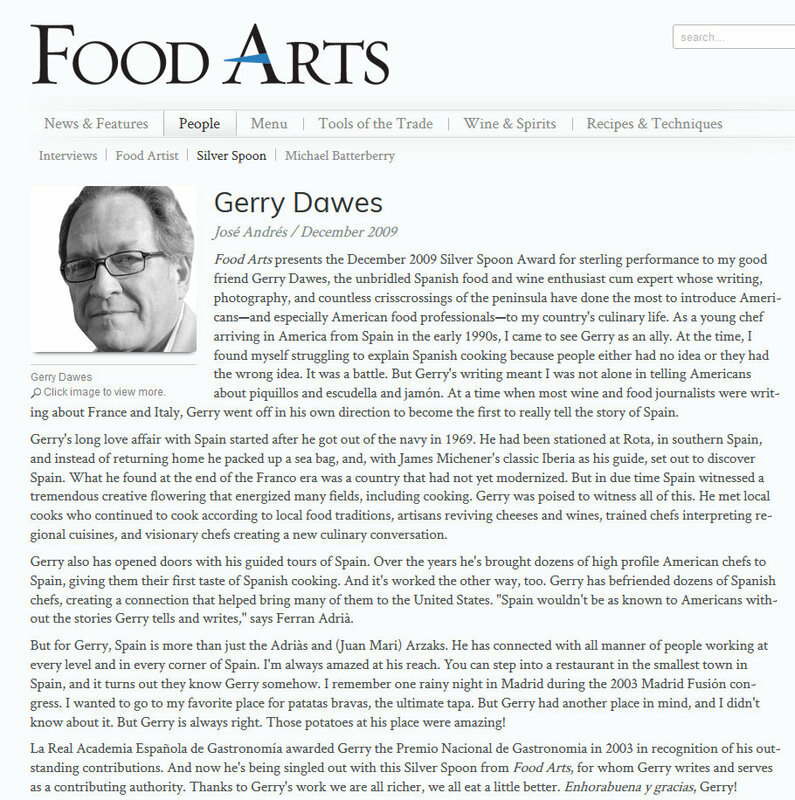 This is one of best wine and food fairs I know and another no-miss event for wine and food professionals and aficionados of the best of Spanish products. 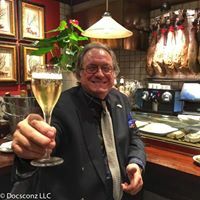 For more than 30 years, Grupo Gourmets has been the publisher of Club de Gourmets magazine and an outstanding guidebook series that includes the annual Gourmetour Guía Gastronómica y Turística de España and the Guía de Vinos Gourmets wine guide. 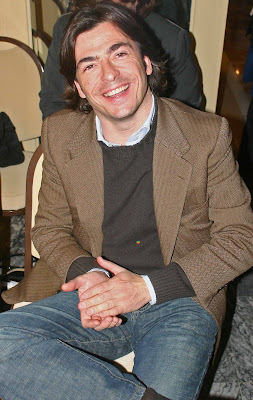 Also in April and coinciding with the Salón de Gourmets, the group behind verema.com, started a new upscale bienial wine event, Vino Elite, which featured some of Spain’s top wineries and seminars by such luminaries as Spanish art film maker José Luís Cuerda (also owner of the D.O. 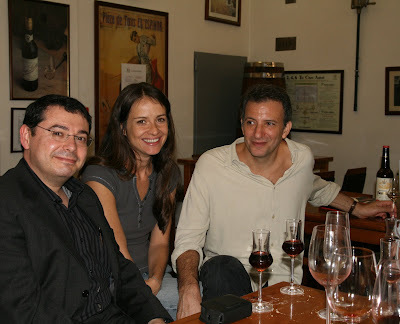 Ribiero wine, Sanclodio), Jonathan Nossiter of Mondovino wine documentary fame and his wife, Paula Pradini, who showed her Mondoespaña segment. 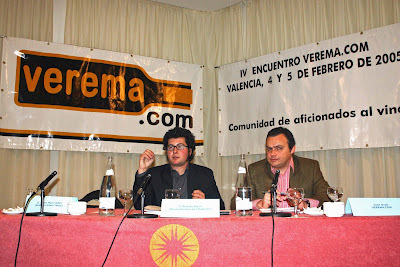 The verema.com group and Emiliano García—owner of Casa Montaña (a revered Valencian bodega and tapas bar that dates to 1836) and Aranleón (a very promising new Utiel-Requena winery), also staged another star turn tasting event, Vino a Toda Vela (Wine at Full Sail), one of a string of events celebrating Valencia’s turn at playing host to the America’s Cup yacht races. The event, which featured top wines from Spain and around the world was held in the cloister of the 500-year old monastery that now houses part of the University of Valencia. 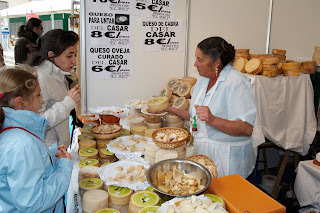 The Feria Nacional del Queso (National Cheese Fair), of Trujillo (Cáceres province) in the region of Extremadura, has taken place the first weekend in May since 1986. Called the most important cheese fair in Europe, this consumer-friendly event has nearly 100 cheesemakers showing some 300 different cheeses, which can be sampled with local wines by buying tickets that are exchanged for tastes at each tented stand. The fair takes place outdoors in Trujillo's spectacular, historic Plaza Mayor, the main square, which is surrounded by distinguished buildings and the large equestrian statue of Francisco Pizarro, the conqueror of Peru. 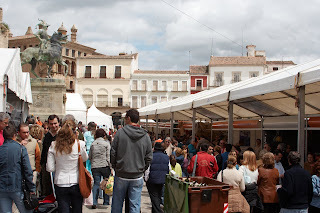 Cheese Fair in Trujillo's Main Plaza, La Plaza Mayor. This is a wonderful fiesta for cheese lovers. All one has to do is show up, make your way to the Plaza on foot, purchase some tickets and enjoy a superb range of artisan cheeses, the majority of which are from Spain and neighboring Portugal. The local Extremaduran cheese such as the ewe's milk Torta de la Serena, Torta del Casar and Tortita de Barros, along with Trujillo's own goats' milk cheese Ibores, are superb and among the best cheeses in Spain. Cheese stand at Trujillo's Feria del Queso. 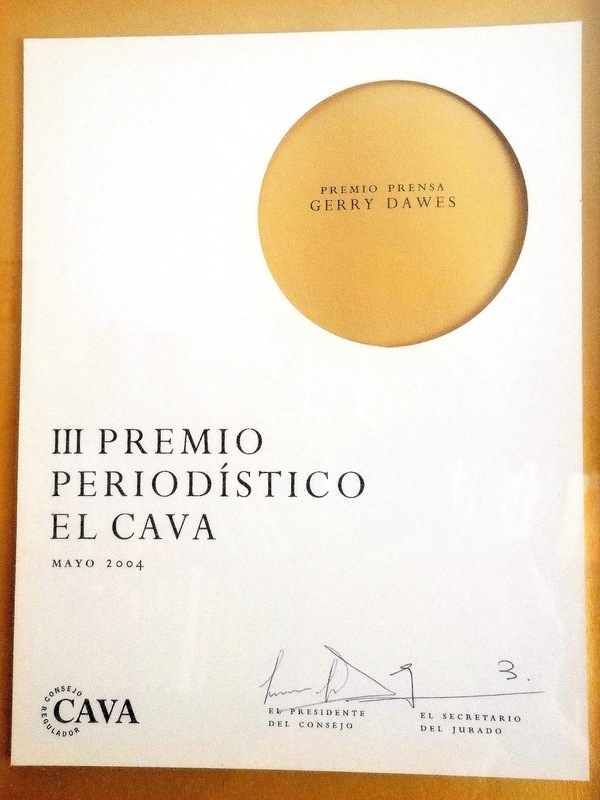 Following on the heels of those events was Castilla y León’s most important wine judging event, Premios Zarcillo, in which wineries from this large region’s denominaciones de origen, which includes Ribera del Duero, Rueda, Toro, Bierzo and Cigales, vie for the coveted Zarcillo de Oro top prizes in each category. The judges—a distinguished group of Spanish and international tasters—labors for several days tasting hundreds of wines from the region (and beyond; there are wines from other Spanish wine regions and foreign countries) in an unforgettable setting in the heart of the Ribera del Duero at the 14th-century Castillo de Peñafiel, one of Spain’s most spectacular castles and now the Museum of Wine. After the Premios Zarcillo, Fenavin (Fería Nacional del Vino), Spain’s biggest annual trade fair dedicated solely to wine, takes place the second week in May in Cuidad Real. Fenavin has more than 1,000 exclusively Spanish bodegas exhibiting in seven pavilions and some 2,500 wine buyers and importers scour the exhibition spaces for four days seeking new treasures for their portfolios. This fair also features some of the best wine seminars in Spain with top experts from the around the world and Spanish experts who are only a short AVE high-speed train ride away from Madrid. 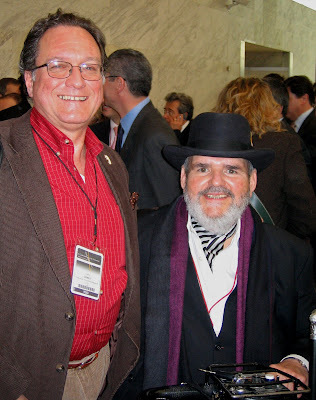 Another bi-annual fair, and one of the most rewarding, is The Vinoble International Noble Wines Exhibition, is held every two years at the end of May in Jerez de la Frontera. 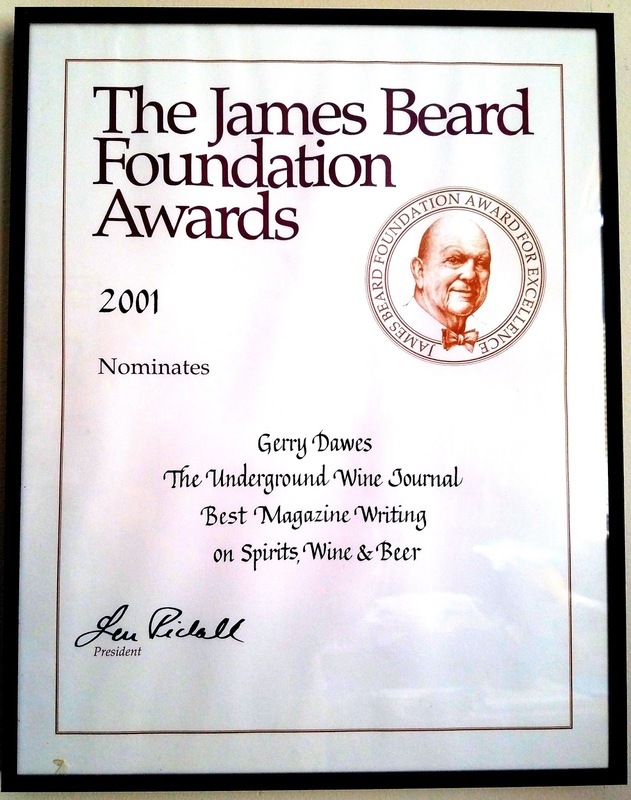 In 2008, it will be staged from May 25 through May 28. It is the only wine fair dedicated exclusively to fortified, dessert, and naturally produced sweet wines, not just from Spain, which has a much overlooked vibrant production of luscious wine in this genre, but from around the world. The setting for Vinoble is Jerez’s beautifully renovated 12th-century Arabic Alcazar fortress, which dates from the Almohade epoch of the Moorish occupation of Spain. The site is spectacular with wine tasting stands occupying the gardens of the Alcazar, and wine tastings such as a Château D'Yquem retrospective and a palo cortado Sherries presentation are held in the complex's former mezquita (mosque) and tasting pavilions in the Renaissance Palace of Villavicencio, which was built within the walls of the fortress in the 17th and 18th centuries. More than 100 noble wine producing areas for from fortified and sweet wines from around the world show their best labels at Vinoble. But, at Vinoble, as might be expected, it is the host country, Spain, which shows the most extensive variety of high quality sweet and fortified wines. Local Sherry bodegas bring out a broad range of high quality fortified wines--finos, manzanillas, olorosos, amontillados, creams, pale creams, moscatels and Pedro Ximénez sweet wines, as do bodegas from nearby Andalucian wine regions such as Montilla-Moriles (Cordoba) with a range of finos, amontillados, olorosos and Pedro Ximénez; the Condado de Huelva with fortified Sherry-like wines, including delicious orange essence-flavored ones; and Málaga, which showed some exceptional moscatels. 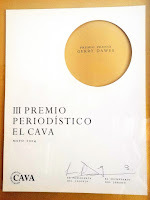 Cataluña was represented by sweet wines from Penedès and Priorat; Valencia by sweet mistela moscatels; Navarra by late harvest moscatels and vinos rancios; Alicante by moscatels and fondillones; Jumilla by late harvest Monastrell-based wines; and Rueda, Rías Baixas and Yecla by late harvest entries. Only in Jerez at Vinoble can wine professionals and aficionados alike find such a broad range of high quality "Noble" wines. Even one day at Vinoble is an education into this relatively little-known, magical world of late harvest, fortified, botrytisized, dessert and dry wines such as manzanilla, fino and amontillado Sherries. Touring the Spanish stands in May 2006, I was able to taste an amazing array of wines that underscored the importance of this emerging genre of exceptional wines from all around Spain. All these food and wine fairs take place before June, but there is more. 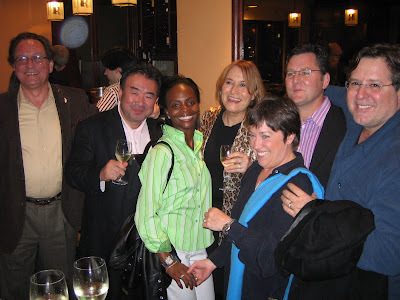 On the first weekend in August, there is the lively Fiesta de Albariño (no permanent website) in Cambados, a charming Galician seaside town in the Val do Salnés region of Spain’s top white wine producing area, Rías Baixas. This region is where a wide range of producers make most of the excellent Albariños that are so food-friendly to modern (and traditional) cuisines have taken American wine lists by storm. Scores of the Val do Salnés region’s best Albariños are available for tasting at open-air stands along an esplanade outside the Parador de Cambados. 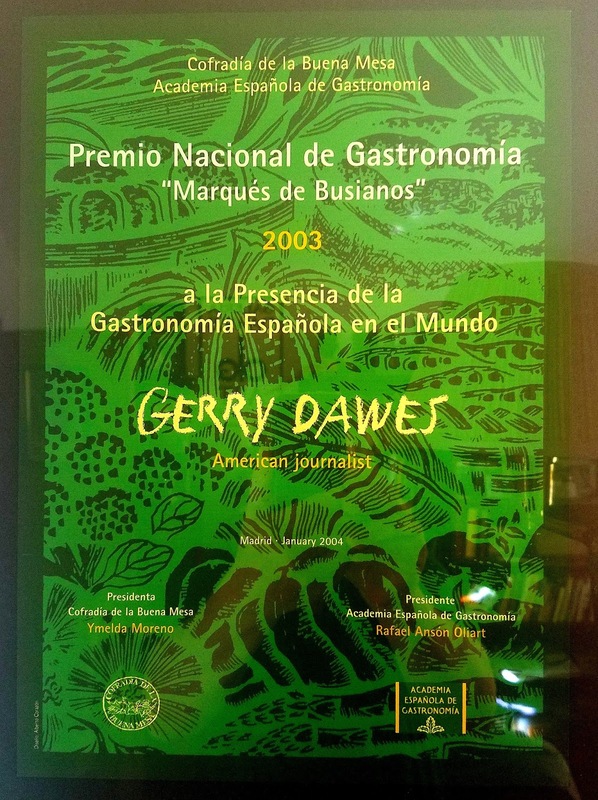 Top wine journalists (and one American, this writer) taste wines for two days to select the top Albariños each year. Do Ferreiro Cepas Velhas Albariño & Nécoras (Crabs) from the Rías of Galicia, from which comes some of the world's greatest shellfish. Those who think they might not get enough Albariño at Cambados can show up a week earlier for wonderful, little-known, country Albariño wine fair in Meaño, where more than a dozen small wineries from the Asociación de Bodegueros Artesanos, led by Francisco Dovalo of Cabaleiro do Val, stages a weekend showing of their artisan wines, along with Galician bagpipe music and culinary specialties such as pulpo a la gallega (octopus steamed or grilled and sprinkled with Spanish olive oil, superb Spanish pimentón [paprika] and sea salt) and local shellfish, which is some of the best in the world. 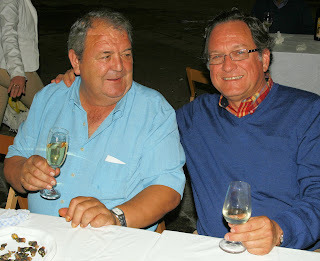 With Francisco 'Paco' Dovalo, Presidente of the Asociación de Bodegueros Artesanos at their Albariño wine fair in Meaño. I have gone to all the events described in the past two years and was privileged to be invited to speak at several of them. I could have kept on going to any number of Spanish harvest wine fairs in September, October and November, when the great chefs conference, Lo Mejor de la Gastronómía, takes place in San Sebastián, and the excellent IberWine, billed the Salón Internacional de Vino (a biannual event devoted to Spanish and Portuguese wines that alternates between Madrid, Portugal and the U.S.), but even a marathon Spanish wine geek like me needs a respite sometimes. Still, I can’t wait for the next round to start each year.